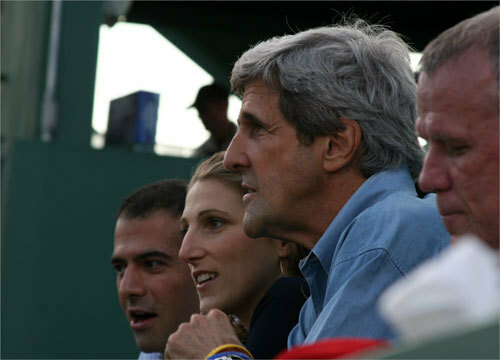 We ran into Massachusetts senator John Kerry on the Monster while taking the pulse of Red Sox Nation on Manny Ramirez's absence from the lineup Friday night. The senator was asked if fans should be concerned that Ramirez wasn't playing. "I hope not, I hope not," said Kerry. "If he says his knee needs a rest, then he gets a day to rest his knee. I know Terry Francona and John Henry werent happy with how it all went down. But lets focus on the game at hand." Seated to the right of Kerry is his daughter Vanessa.